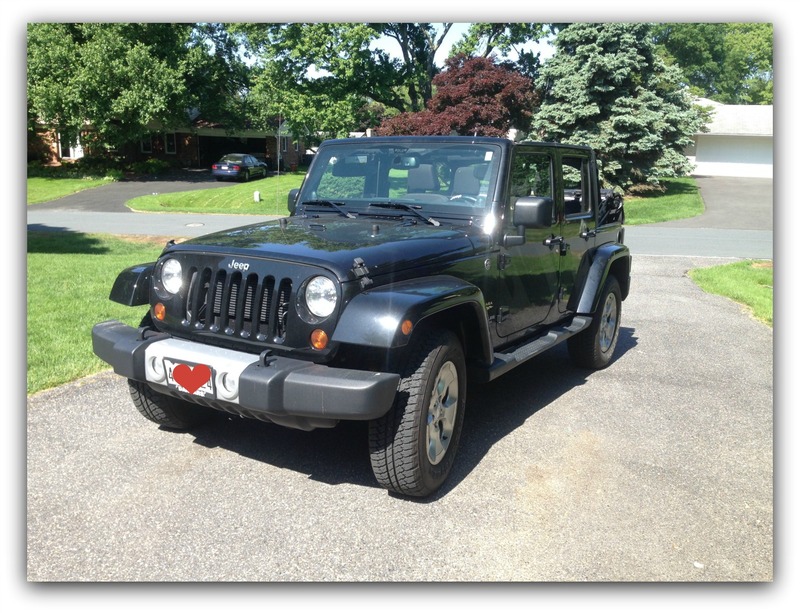 A year ago we traded my mommy car for my Jeep Wrangler Unlimited. It has been the best purchase I have ever made. I only wish I would have done it years and years ago. I find myself saying that a lot lately. "I wish I would have..."
As you get older you realize your time on this planet is running out. Those "I wish I would haves" are going to keep growing unless you just do it. So now, that's my new motto. No more wishing, just doing. And that's what I did last Friday. 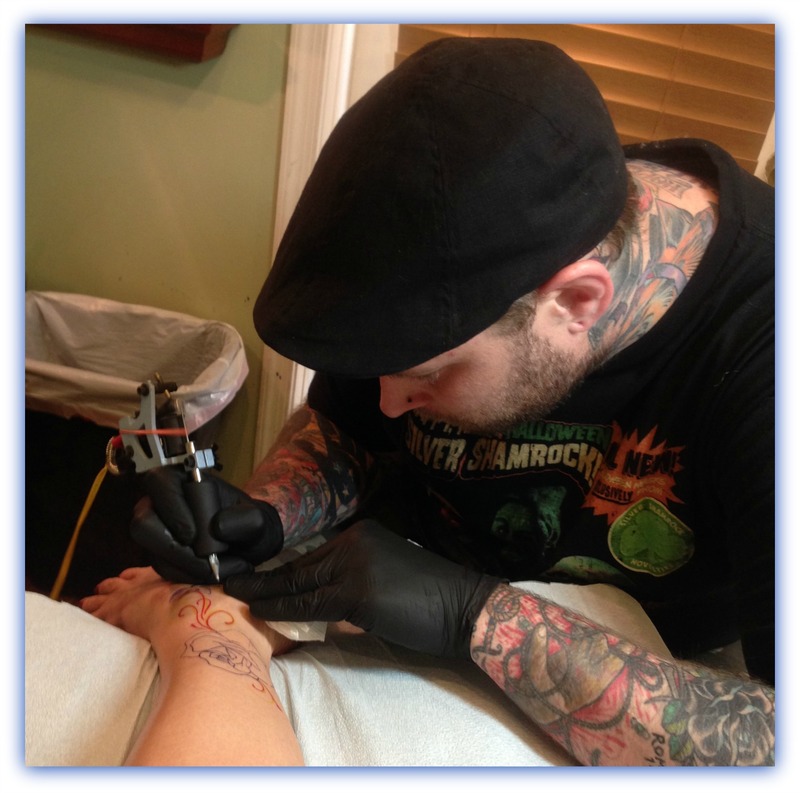 For years I have been wanting a tattoo, but many things kept holding me back. The fear of the pain for one. Judgement from friends and family was the other. Well, I figure if I can give birth, I can probably tolerate a little old needle gouging my skin for an hour. As far as being judged... well - I decided it's time to quit worrying about what other people think and just do what makes me happy. I don't want to be on my death bed having regrets -- wishing I would have done... So now I'm trying to live my life with no regrets. 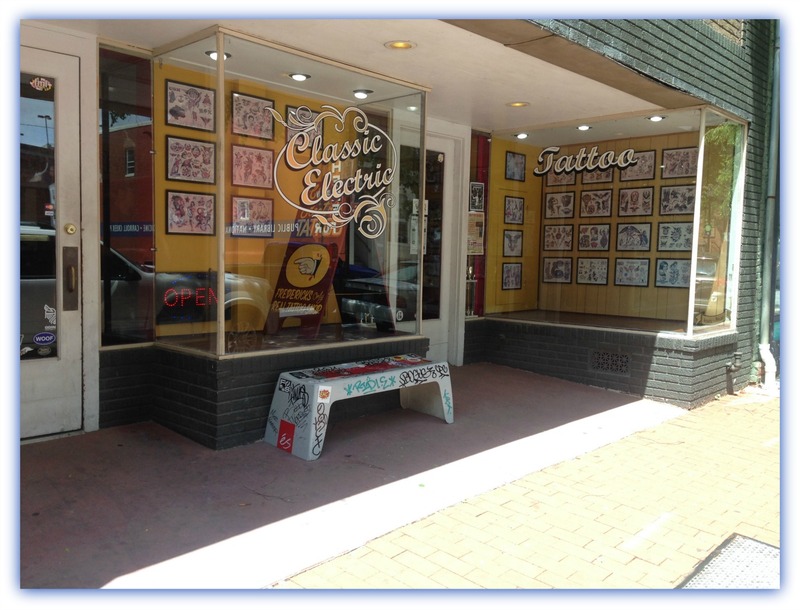 Friday at noon I walked into Classic Electric Tattoo in Frederick, Maryland. Butterflies filled my stomach, but I was also very excited to be checking off another Bucket List item. A good friend of mine recommended this shop so I was confident in the work. But I was nervous that my artist would have a different vision then me and I would have to come back. So I met with the artist and we discussed what I wanted. I had emailed some ideas earlier as well. Then came what ended up being the hardest part of the whole process. Waiting... 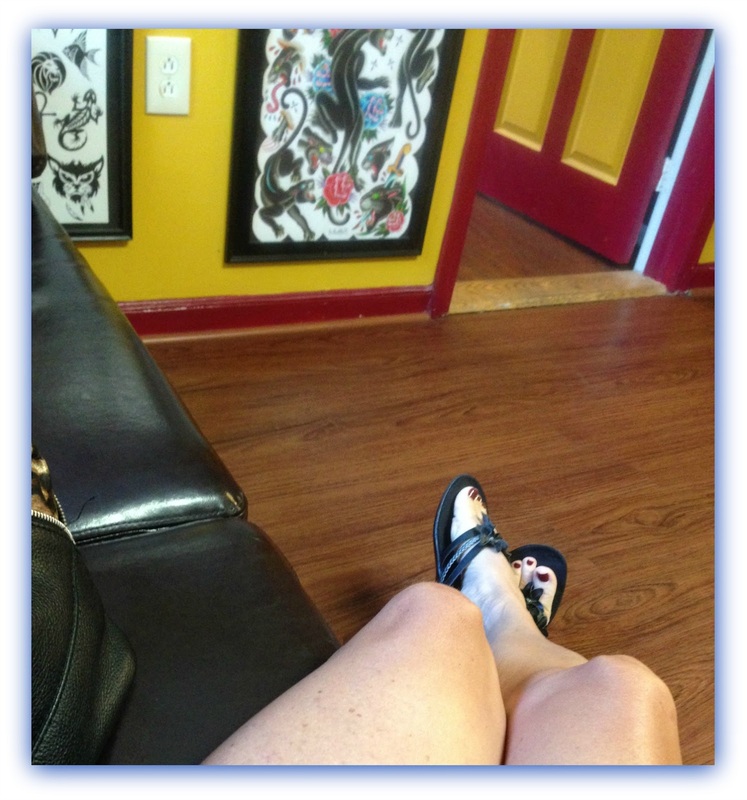 Waiting for my artist, Thomas Kenney, to draw up my vision. Finally after about 15 minutes he came and got me. We walked back to his station. He immediately set out to work. He applied his artwork to my leg. His confidence put my mind at ease and I began to relax. When I saw his work I was ready to begin. It was perfect! The next step in the process was to tie it all together. He added some free hand "swirlies" with a highlighter and permanent marker. If only the process of getting the ink onto the skin where that easy and painless. Something everyone failed to tell me about getting a tattoo is the top of the foot is one of the most painful places for a tattoo. And where is the first place he started? ON THE TOP OF THE FOOT!! Needless to say those hours in childbirth paid off because I was able to scream in pain with no worries about who was listening. As he moved up my calf the pain wasn't as intense. 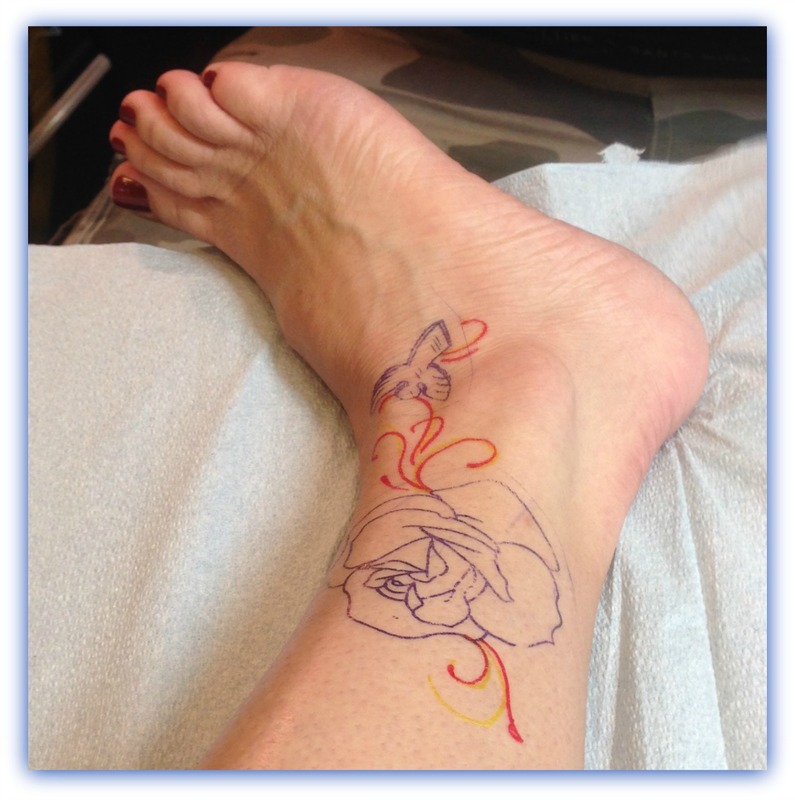 He finished the outline of the tattoo and then was ready to fill in with some color. I've heard from many people that when you get a tattoo it's something that will stay with you your whole life. Well, HAHAHA not me. My tattoo is only with me for maybe half my life. 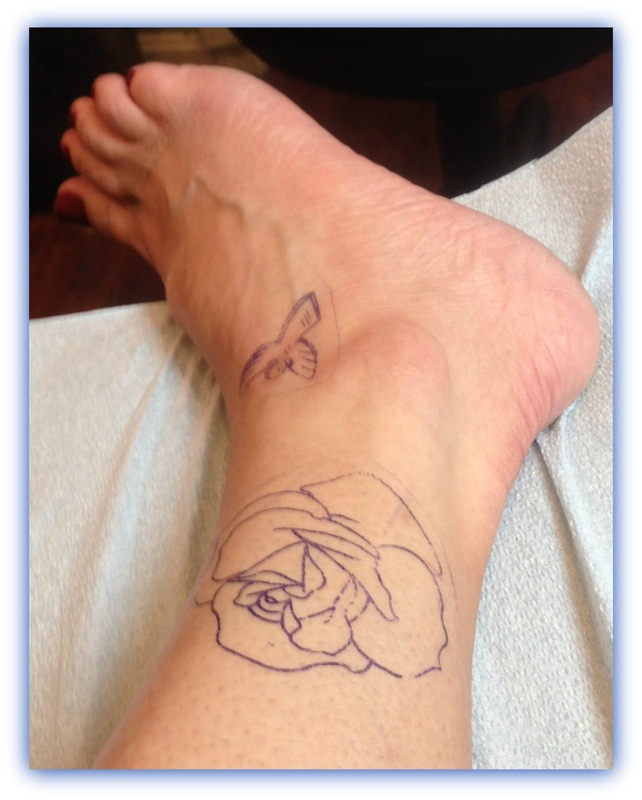 The outline of my tattoo was complete. Now a permanent part of my body as long as I'm alive. The new me is born. Next came the color. Blue... I picked a blue rose and angel for personal reasons. 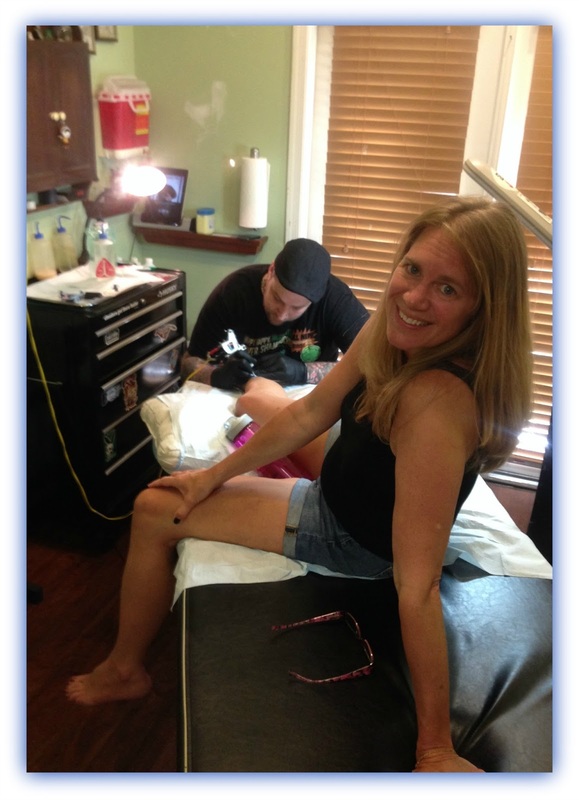 When you get a tattoo it becomes part of you for life and should hold special meaning to you. A blue rose means mystery and longing to attain the impossible. 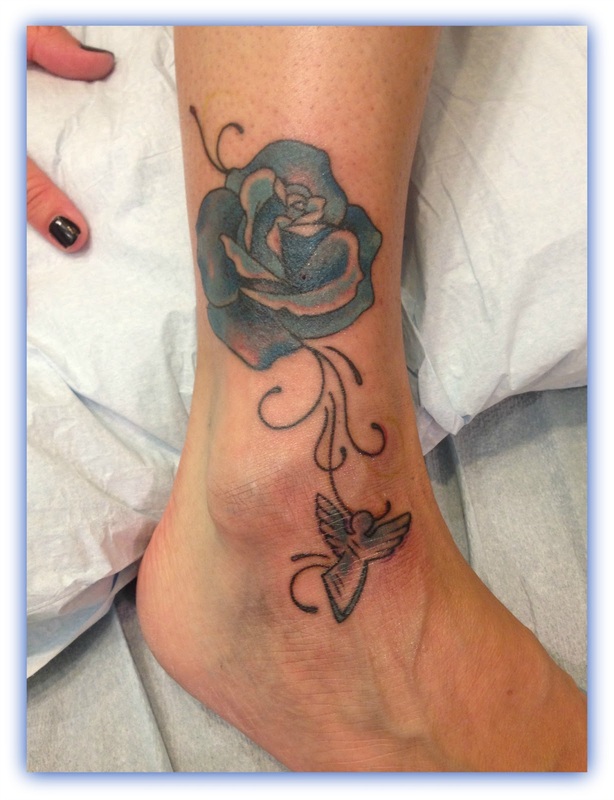 Some cultures say the holder of a blue rose will have their wish granted and can signify hope. 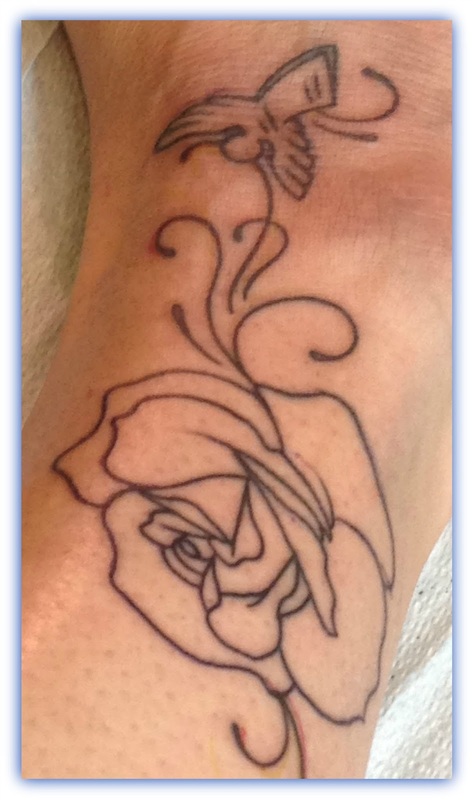 It is also said the blue rose means you are extra-ordinarily wonderful. It can also mean new opportunities, new possibilities and the mysterious beginnings of new things. As I venture into this next phase of my life this rose will remind me of the exciting life I still have left to live. All the new opportunities and possibilities await me. The angel is a reminder that I have a guardian angel and the angels are whispering to me to help guide me on my adventure on this next phase of my life. As you can tell from this picture the pain isn't really that bad. The whole experience was very cathartic for me. It was a good pain because I realized once it was done something wonderful and beautiful would be a part of my life forever. It was also important to have an artist who makes you feel at ease. Helping me to realize this was my tattoo and it's now a part of me. So now what's next... Tomorrow I'm heading back up to Frederick to book my next appointment. It's true what they say about tattoos being addicting.